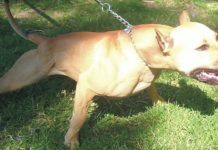 Pit Bulls and Spring Poles - Fighting Tool or Really Good Legit Idea? 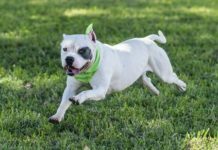 Pit Bulls and Spring Poles – Fighting Tool or Really Good Legit Idea? First and foremost, yes dog fighters use spring poles. So do I. So does almost every single person I know. Oh, and I don’t know any dog fighters. 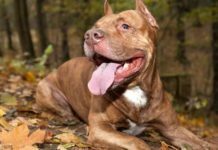 PETA and other “humane” organizations put out these, “signs of dog fighting” lists that are full of rubbish and misleading information. 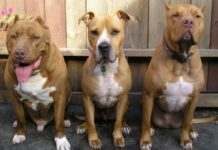 Did you know that most people would report me for dog fighting if they saw my yard? Why? I have a spring pole and more than one Pit Bull. 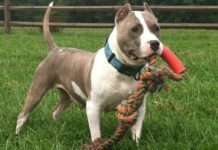 The Spring pole is a simple tool to exercise your Pit Bull. Nothing more, nothing less, nothing amazing. I get a dozen or so questions about spring poles each month. Mostly people wanting to know how to build one. Concept: A springy mechanism attached to a toy or “bite surface” assembled in a way that a dog can grab and hold the toy and at the same time tug while the spring provides resistance. How to Build One: Get a spring and attach a toy to it. This may seem ultra simple. Well, it is. I have seen complicated set ups to set ups that get the job done. The ones that get the job done are so simple you’re amazed when you think back to when you were having trouble building one (I had trouble at first). Following are pictures of my set up. Use this as example for your own set up. The first picture here is the entire set up. Yup. Fancy huh? Picture #2 – This is how the spring pole is attached to things. I prefer over hanging tree branches (you can take this with you on camping trips, hiking, to the park etc…) but you can attach it to just about anything that will accept a chain to be wrapped around it and is strong enough for your dog. Picture #3 – The clip you attach your toy to. If you have a rope toy with a knot, you can simply clip this around the knot and presto, nothing else is needed. However, if you want to get fancy, you’ll have to come up with some stuff on your own. I have a “fancy” set up where I use a rope toy that forms a triangle to allow a good firm bite. However, I also use a simple $5 rope toy from the pet store too. Pretty amazing huh? lol. Kidding, really, it’s a simple thing to build a spring pole. I know I had some trouble creating my first until the Power leash set up I discovered. From there it was a simple process of getting the right parts and putting them together in a way that would be safe, secure, and more importantly portable. I like to take my set up with me. It’s great for your dogs and it’s fun showing people. They are amazed at the dogs abilities. The above set up consist of a spring, three carabineers, one snap carabineer and two locking carabineers, and a toy (not shown). Pit Bulls love their spring poles. It gives them a taste of the ancient ways and burns off some serious energy in the process. 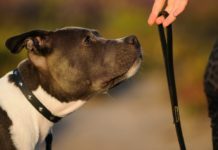 They do not cause aggression or any dog to “snap” if a dog does that, it was unsound to begin with. For safety, keep it semi low to the ground so your dog can touch their back feet. If you have a serious hang time dog and they have proven to be good solid hangers, raise it up a bit. Consult your vet before starting. I can’t say this enough, always, always, get your dog looked at before you put them on something that works them out hard. Joints, good lungs, no heart problems, and over all health are good starting points for your vet to look at.